Among the picturesque fells and valleys of the Lake District national park, Angharad Moran discovers a host of glorious historic estate gardens that have been lovingly cultivated and charming visitors for centuries. One of the most striking things about this grand, Grade I listed garden is its array of topiary which is some of the oldest in the world. There’s something quite magical about being able to wander through arches cut into the beech hedges, discovering topiary pillars and pyramids carved out of Golden Yew and Box along the way. Each year, four dedicated gardeners spend about a month scrambling up and down scaffolding towers in order to reshape the topiary, which can be up to 10 metres tall. 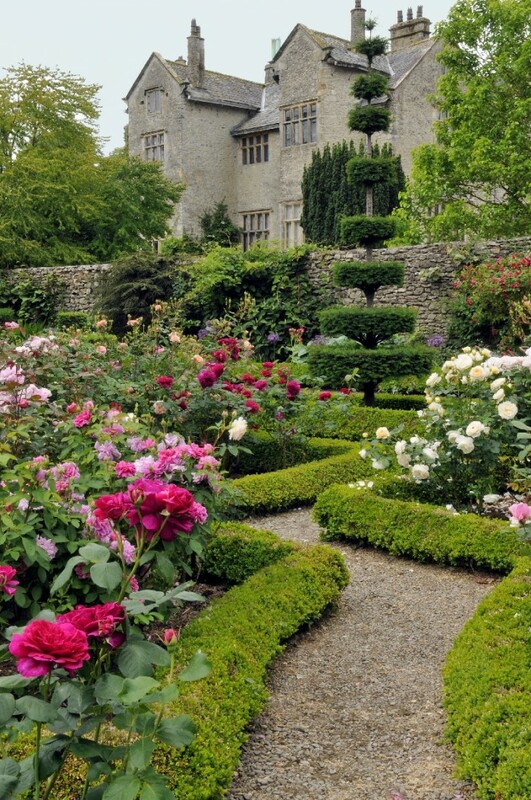 Beyond their creations, the gardens are packed with seasonal flowers such as tulips and pansies, while the wisteria clinging to the walls of Levens Hall helps to incorporate the building into the garden. You can also pay a visit to the apple orchard or the colourful rose garden where you can wind your way along the snaking paths bordered with vivid green ribbons of Dwarf Box. The gardens date back to 1694, six years after Levens Hall became the property of Colonel James Grahme, who extended the building and filled it with an assortment of fine furniture and works of art – many of which can still be viewed today. As well as enhancing the Hall itself, Colonel Grahme wanted to create a fashionable garden at Levens, employing Guillaume Beaumont, who was also gardener to King James II and who helped to design the gardens at Hampton Court. Despite being over 300 years old, the gardens at Levens have largely managed to stay true to their original design, with just one or two additions, such as the fountain garden bordered by pleached limes which were added to the estate to celebrate the garden’s tercentenary. Beyond Leven’s gardens you will also find a sprawling park, home to a small herd of Norwegian black fallow deer and rare Bagot Goats. The park was originally a medieval deer park before being reimagined as a recreational park by Beaumont. Thought to have been built over Roman ruins dating from 79AD, Muncaster Castle was first created in the 13th century after the land was granted to Alan de Penitone in 1208. Since then, the castle has remained in the Pennington family and its treasures include a glass bowl granted to the family by King Henry VI in the 15th century, which is known as the ‘Luck of Muncaster.’ King Henry declared that as long as the bowl remained intact, Muncaster would remain in the Pennington family and it has done so ever since. The gardens at Muncaster were developed much later with the First Lord Muncaster creating several garden walks around the grounds in the 1780s. He also planted many hardwood tress which help protect the plants from the cold winds that sweep down the fells. As a result of this, plant life flourishes in this particular area, including several Mediterranean species that would normally be more at home inside a greenhouse, sheltering from the worst of the British climate. Muncaster is also home to one of Europe’s largest collections of Rhododendrons, started by the sixth Baronet, Sir John Ramsden, and you can find great pink plumes of them clustered around the grounds like forests of candyfloss. You’ll also find many rare plants now thought to be extinct in the wild throughout the grounds. The gardening team at Muncaster work closely with the Royal Botanical Gardens at Edinburgh, among others partners, in order to conserve endangered plants and trees, while the estate’s retail plant centre also holds a range of species that are unique to the area, including the primula Ravenglass Vermillion. While spending time at Muncaster you might also like to pay a visit to the World Owl Trust’s Owl Centre which is home to over 200 of these amazing birds. There is even a chance to see the owls in action during one of the hugely popular Meet the Birds displays. A blend of formal gardens and shady woodland sweep across the 25 acres of grounds at Holker Hall, with numerous walks revealing a huge variety of plants. More than 50,000 bulbs are planted annually to ensure visitors are greeted with colourful new displays during the spring. First built in the 16th century, Holker has served as the home of the Preston, Lowther and Cavendish families, with each generation leaving its mark by altering the landscape or house. In the 18th century, Lord George Cavendish added 200 acres of parkland to the estate and deer can still be seen grazing peacefully here today. More recently, William Cavendish, the 7th Duke of Devonshire, was responsible for updating the original Hall after a disastrous fire destroyed the entire west wing in 1871. Today, the current Lord and Lady Cavendish continue to search for new ways to improve the gardens, introducing new varieties of rare and unusual plants. They are also the holders of the National Collection of Styracaceae, a plant family that includes genera such as Halesia, Styrax, and Pterostyrax. During a day spent exploring the gardens, visitors can enjoy wandering through the pergolas under a canopy of flowers, their scent drifting down as bees buzz between the blooms. Alternatively, it is possible to while away an afternoon in the shade of the arbours in the sunken garden, admiring the surrounding floral displays. An awe-inspiring attraction is the colossal lime tree which is over 20 metres high, and has been voted one of the Tree Council’s 50 Great British Tress, with its drooping branches providing an enclosed shaded area around its wide, sturdy trunk. In addition to the abundant plant life, there are some wonderful water features to be found within the grounds, including the early 19th century limestone cascade, which trickles down to a tranquil fountain area surrounded by rhododendrons that shower the floor with their vibrant pink petals. Comprising picturesque farm, park and woodland where you can see cattle, deer and Swaledale sheep, the Dalemain estate dates from the reign of Henry II when a pele tower was built on the land. Extended and upgraded over the centuries, the mansion now incorporates a mixture of mediaeval, Tudor and early Georgian architectural styles. First bought by Sir Edward Hasell in 1679, the estate has remained in the Hasell family ever since, with many family members adding their own touch to the house and gardens over the years. One of the more unusual features that have been added over the last few years is the stumpery, a timber version of a rockery, built using old wood taken from the estate’s collection of 200-year-old oak trees and planted with ferns. This can be found in Lob’s Wood, an atmospheric woodland garden developed by Gertrude Hasell when she lived at Dalemain in the 1920s. Behind the mansion is a genteel Tudor Knott Garden, where tightly coiled rows of Box hedges surround the peaceful fountain at their centre. The Knott Garden is also home to a wonderful selection of delicate flowers including Nicotiana, Antirrhinum, Purple Sage and Viola Cornuta Alba. During the summer, a visit to Dalemain’s Low Gardens is highly recommended as you’ll also be able to view the stunning display of Himalayan poppies, Meconopis Dalemain, which have become famous for their striking, electric-blue colour. The semi-formal gardens that surround the grand mansion date from the 17th century and contain a wealth of rare plants, herbaceous borders and a collection of over 200 old-fashioned roses that scent the air. There’s even a rose walk within the grounds where you can see more of these elegant blooms, along with the estate’s ancient apple trees.